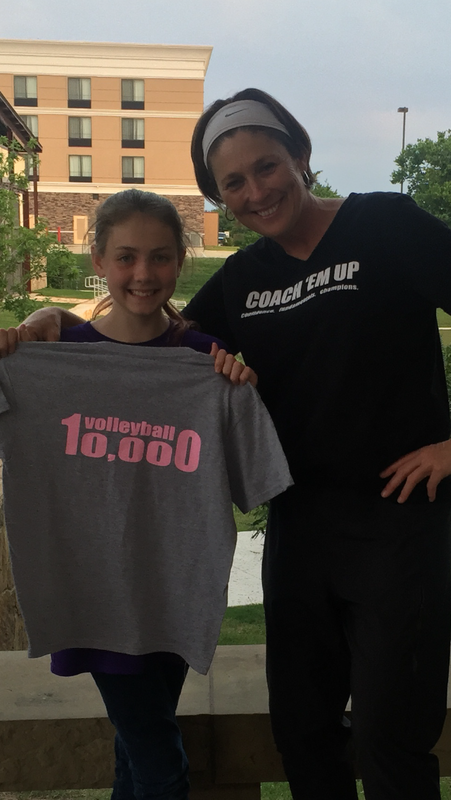 Meet DeAnna, our newest Volleyball 10,000 champion! A: I’ve played for 5 seasons. Q: What’s your favorite part of the game? Position? Skill? A: It’s a real teamwork game. I love serving the best because it’s kind of become my best skill. My favorite position is definitely the Setter! Q: Where did you learn about VB10K – and why did you decide to do it? A: I was at a private lesson. It was at a local school, outdoors on a big wall. It was kind of a basketball court actually. Q: How long did it take you – do you remember where you were introduced to the program (1st time)? A: Yes – that day at the school I knew I could do it. I wanted to accomplish it and Iwanted the cool t-shirt. Q: Who kept you interested or MOTIVATED? – if anyone!! A: My friend (she’s doing VB10K too) and I always talked about it at school and at practice. Q: Did you have a system – how did you build in time for VB10K? A: I pretty much did it after my homework – after school. It took about a year for me to complete it. Q: What was your FAVE Exercise in the program? Q: Do you think VB10K made you better? A: In the beginning I did 5 underhand serves and 5 overhand serves in practice and on my team. Now I do all my serves Overhand. It’s made me a better server without any doubt. Q: WHO inspires you? favorite players, teams? A: My favorite UT LONGHORN! She’s #19 Prieto Cerame and she was really nice to me at camp. Let’s learn more about DeAnna!! Fave food? My Mom’s meatloaf! Read more about the Volleyball 10,000 program.